LabSmith's products are made by researchers, for researchers. We know the value of having just the right tools in the lab, letting you focus on science. By technician on July 3, 2018. For over a decade, LabSmith has been making microfluidic tools used in top research labs around the world, and we are now making these tools available for high-school and undergraduate programs. 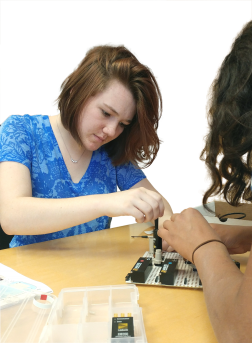 Our Microfluidics Education Toolkits will include a modular array of microfluidic control instruments and sensors, interactive software, and curriculum packages to help educators teach engineering skills along with real-world techniques in biology, chemistry, and microfluidics. The toolkits will allow students to build an array of designs, from simple manually-operated flow-control experiments to fully-automated research-grade instruments, all on a classroom-sized budget. The interactive software and easy-to-follow instructions make getting started a snap, but also allow students to create devices beyond the textbook examples. See our online assembly and automation guide here. Copyright © 2019 LabSmith, Inc.